I wish I had known this years ago when I ran the Media Cloisters! It turns out you can connect multiple USB inputs and outputs on Macs. This is great if you want to team-edit video or record two people at once. You’ll need two USB headsets for this to work. This is built-in functionality for Mac OSX. Plug in both headphones, then open Audio Midi setup from /Applications/Utilities. Make two usb headsets play together! Check the checkboxes beside both headphones. In System Preferences, you can now set the output to go to your new Multi-Output Device. A similar arrangement will work to create two USB inputs. 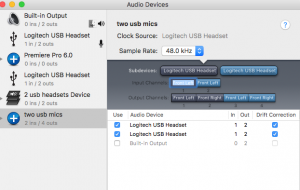 Create an aggregate device for the USB headsets. 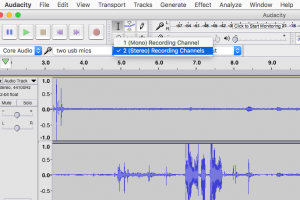 Make two mics record on separate channels!